From left to right, José Luis Jiménez (Group Chief Investment Officer); José Luis Gurtubay (Group Chief Strategy and M&A Officer); Antonio Huertas (MAPFRE Chairman & CEO); Fernando Mata (Chief Financial Officer and Member of the Board), and Natalia Núñez (Investor Relations & Capital Markets Director). 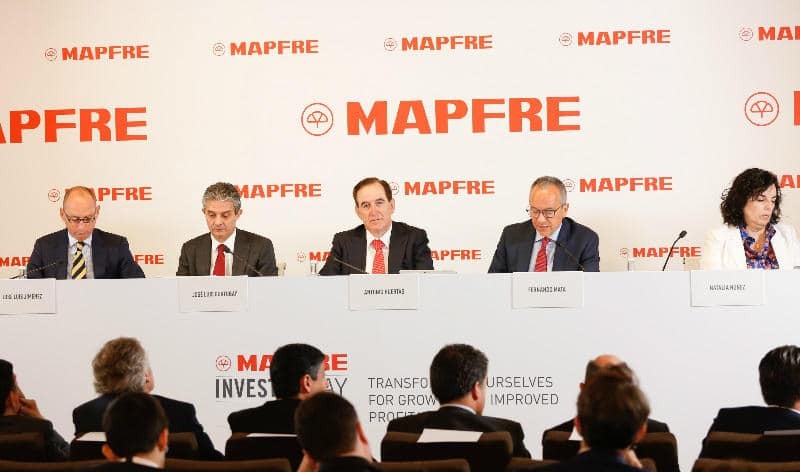 MAPFRE held the third edition of its Investor Day in Madrid today, which saw more than 60 investors, analysts and other financial experts gather to learn more about the details of the company’s new strategic plan for 2019-2021, announced recently at the Annual General Meeting. The meeting, which was also streamed live on the Internet, featured contributions from nine members of MAPFRE’s senior management, with more than 60 investors, analysts and finance experts taking part. This initiative, which featured presentations by a number of the company’s principal managers, falls neatly within the company’s transparent action framework, the objective of which is to boost both the quantity and quality of information that different MAPFRE stakeholder groups receive. This year’s meeting was also broadcast live on the Internet via MAPFRE’s website. 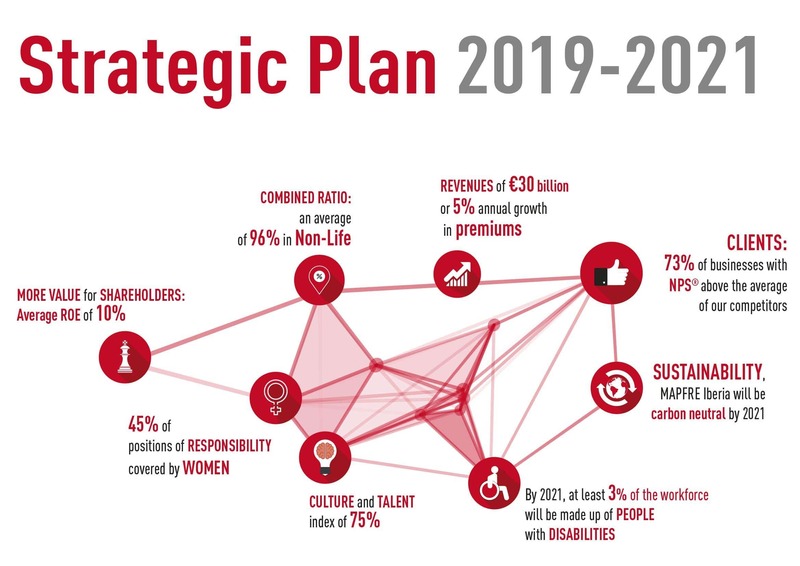 Under the slogan “We’re transforming for improved growth and profitability”, MAPFRE’s new strategic plan maintains the focus on two critical drivers of Group activity: the client and business profitability, and is supported by client orientation, excellence in technical and operational management, culture and human talent, with transformation as the backbone of everything the company does. 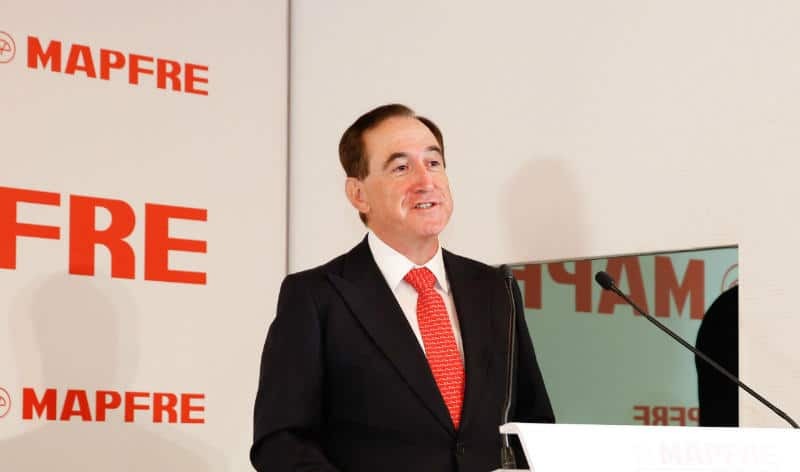 MAPFRE envisages growing sustainably, achieving 30 billion euros in revenues by 2021, or average premium growth of 5 percent over the three-year period, boosting its Life business profitably, with average Life Protection premium growth of 8 percent over the course of the three years, at constant exchange rates. The situation in some of the Group’s most strategically important markets was also analyzed during the meeting. Speakers from Brazil and the United States explained their respective financial positions and investment strategies, as well as the innovation push being made through MAPFRE Open Innovation (MOi).